Da Tech Guy calls his Vük interview the most telling and important interview that he has done among the 60 videos he has shot since hitting CPAC, and Peter Ingemi is absolutely right. the MSM has been telling [us] that a young woman of color like [Lea] has nothing but disdain for conservatives in general and Donald Trump in particular. If you believe them she shouldn’t exist but there she is and if there is one Lea in a county of 300+ million there are likely hundreds of thousands of others out there not wedded to the MSM narrative of doom and gloom. … She gave the President mixed marks, complemented him on keeping campaign promises that he made to his people, noted that as a Democrat she’d like to see some more moderate moves. Her answers had none of the rancor or the division that the media has pushed on us for the year or that I’ve seen from angry activists. They were completely reasonable answers that would not have been out of place several decades ago in a saner time when I remembered people could disagree and get along. In other words they reflected who she is, a normal American trying to get by whose primary focus is real life instead of manufactured outrage. Towards 5:30, Lea mentions which essential oils company she works for, which is doTerra, but I can't quite understand the letters after the "/" (N or M? A or N?). 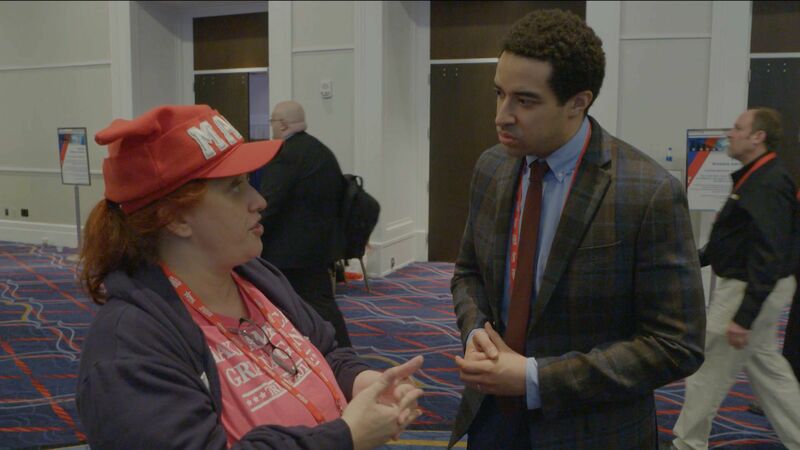 Among other people interviewed at CPAC by Peter Ingemi is Myra Adams. And you wonder why Donald Trump calls it Fake News?! I think we should all be eternally grateful to the Daily Show for sending The Opposition w/ Jordan Klepper to CPAC (tak til TFP), as Kobi Libii, Tim Baltz, and Jordan Klepper give a stellar example of dishonesty in the mainstream media or, certainly, in the comedians that the MSM is always celebrating (video here). What it also shows is, as Instapundit's Glenn Reynolds continuously points out, that you should always record an MSM interview with your own hand-held device. (In our defense, everybody was being interviewed right and left, and we had no idea that this group was composed of independent (sic) satirists from Comedy Central.) Update: Speaking of which, thanks to Stephen Green for the link. In one instance — at least — each and every single line of an "exchange" comes from totally different points in the "interview" (sic). In the experience of the No Pasarán blogger in the Stars and Stripes shirt, at least, the interview lasted 20 times the amount of time in which he appears that included a lot of give-and-take as well as intelligent or at least reasoned arguments. This technique is known as “the Jon Stewart.” What you do is take a few seconds (or, in [the case of Katie Couric], a few minutes) of reaction shots (the footage they shoot of people’s faces while other people are talking) and then insert that non-talking footage after a question is asked: Voilà, the opposition is literally speechless. Needless to say, that is an outrageously dishonest cut that deliberately ignores the point that was being made. First of all, notice the cuts: as it happens, each and every single one of those three lines comes from totally different points in the interview. That the argument is cut may not come as a surprise, but even the "That's right!" does not come immediately after "Move on, liberals!" It's a bit of fluff talk from elsewhere expressly moved to make the interviewee appear mindless. Liberals keep saying, there are, like, 400 mass shootings a year in America [DAILY SHOW CUT]. But why is it that nobody, no conservative, no liberal, no pro-gun activist, no anti-gun activist, can mention those 400 shootings a year? Why, in other words, aren't/weren't 99% of them reported? Why can most people, whatever their point of view, not quote more than three or four shootings a year? Well, first of all, the number of dead in the definition of mass shootings has been reduced to appear meaningless. Just as important, most of the mass shootings are not reported for the simple reason that they involve criminals shooting one another. Should they be ignored in the debate? Yes, if you are a liberal trying to demonize your opponents. • Do you know why statistics are like a bikini? • Because they reveal a lot, but… they hide the essential. That's a great line (if I may say so myself), whoever is making it, and you would think that that one-liner would make the cut of a TV show and/or a comedy show, but it makes conservatives look less than humorless and clueless clods, so it ended up on the cutting floor. The blogger at No Pasarán is making a (more or less intelligent and/or reasoned) argument — one which you never get to hear — and Jordan Klepper starts bringing in, goading us with, irrelevant comments ("the cashier at Gadzooks, or the hot topic person piercing ears, they should have an AR"). At this point the person interviewed agrees, he or she fluffs, for the simple reason that it is (kind of) irrelevant and he or she want to get back to the point they are making, but all that is deliberately sent to the cutting floor. The argument in this case that Kobi Libii, Tim Baltz, and Jordan Klepper failed to keep were as follows: liberals want America to be more like Europe, more say like Scandinavia, but in 2011 Anders Breivik killed more people in Norway than were ever shot in any school in the United States or even during the worst mass shooting in U.S. history. Do you think the teen-agers at Utøya island would have approved of somebody present with guns? Is it unrealistic — or uncouth — to wonder whether the tolls would have been lesser had a few of the adults in each place carried a weapon and tried to shoot back at the respective killers? The Forrest Gump remark is deliberately misleading too — natch — because Jordan Klepper turns the issue into the basic innocence in Tom Hanks's fictional character in a sweet comedy, whereas the real issue is the very tendency among liberals to regularly portray mental cases as harmless messiah-like beings who turn out to be (far) more loving than us regular people, superior souls who touch everybody they meet. In this perspective, Jordan Klepper comes with other deliberately ridiculous asides ("you're drawing a line between Forrest Gump and school shootings" CUT "and that's a line people are afraid to draw" CUT "shooting with an AR-15 — Forrest Gump") that the interviewee seems to agree with ("that's it"), for the simple reason that he wants to get back on message. What really happened during the interview, indeed, is that I specifically countered the assertion, pointing out that the point is not Forrest Gump himself, or even the vast majority of mental cases, most of whom probably are harmless, but the tendency to see all mental cases as basically harmless, and thus failing to intervene when the handful of dangerous ones need to be put under some form of control. Straight to the cutting floor. The Forrest Gump quote comes from What Is to Blame for Mass Shootings? Does the Blame Lie with the Right to Bear Arms Or Can It Be Found Elsewhere? In other words, what artists, and leftists, are basically helping to "prove", over and over again, is that the average American, the average citizen, the average human being (who is unlike themselves) is a clueless and/or bigoted "deplorable" (someone obviously in need of some sort of betterment treatment). We should all be eternally grateful to the Daily Show for sending The Opposition w/ Jordan Klepper to CPAC (tak til TFP), as Kobi Libii, Tim Baltz, and Jordan Klepper give a stellar example of dishonesty in the mainstream media or, certainly, in the comedians that the MSM is always celebrating. In a piece titled Liberals Can’t Tell the Difference Between Satire and News, and GOP Presidential Campaigns Are Paying the Price, [Jim] Geraghty noted examples of fake quotes, attributed to Republicans, that were nonetheless perceived as genuine by people already inclined to hate their supposed speakers. … These people remind me of grown adults who still think that professional wrestling is real, except WWE fans aren’t nearly as smug. Over the last four days conservatives around the world gathered in National Harbor, MD because they know now is #ATimeForAction. Watch the full recap of #CPAC2018 below. Update 2: After, later in 2018, it was announced that Sacha Baron Cohen's satirical seven-episode “Who is America?”, exploring "the diverse individuals … across the political and cultural spectrum, who populate our unique nation”, it transpired that, according to a source familiar with the project, "it was nothing more than a Hollywood hit job on Trump supporters and the Republican Party." … For my interview, my daughter and I were asked to travel across the country where Cohen (I presume) had heavily disguised himself as a disabled US Veteran, fake wheelchair and all. … The disrespect of our US military and middle-class Americans via Cohen’s foreign commentaries under the guise of interview questions was perverse. Here is my challenge, shallow Sacha boy: go ahead – air the footage. Experience tells us it will be heavily edited, not pretty, and intended to humiliate. … White House Deputy Spokesman Raj Shah said the video was an “obvious act of deception.” Senator Orrin Hatch, R-Utah, who sits on the Senate Judiciary Committee said that the controversy was proof that Kavanaugh had performed well at the hearing. 'Jordan Klepper Solves Guns' recycles the same liberal talking points without letting the other side speak. What is obvious about Comedy Central's hour-long special? asks Hollywood in Toto. It’s hopelessly biased against the 2nd Amendment, the NRA and anyone who supports gun ownership in 2017. … Klepper has solid comic timing and offers some choice ad-libbed comments. Too bad he’s deathly afraid of talking to someone savvy on the “other side” of the gun control debate. … At no point does Klepper let a smart, rationale gun rights expert counter the show’s battery of vague arguments and context-free statistics. … Guns are bad. End of story. … The special’s sober through line? Attacking the NRA. It’s all that organization’s fault. The group lobbies too aggressively and spends too much money to be defeated. It employs “buttloads of fear” and “patriotic manipulation” to get the job done. Never mentioned? The Brady Campaign, Everytown for Gun Safety and Michael Bloomberg’s massive war chest supporting gun control initiatives. Why, it’s like the special is being disingenuous on the subject. … The irony that [Klepper is] deathly afraid of hearing a sane soul on the other side of the issue, or changing his own mind, is lost on him. And [on] the special. … It hardly helps that Klepper might be the most smug comedian of the modern age. The fact that he repeatedly acknowledges that fact can’t change reality. 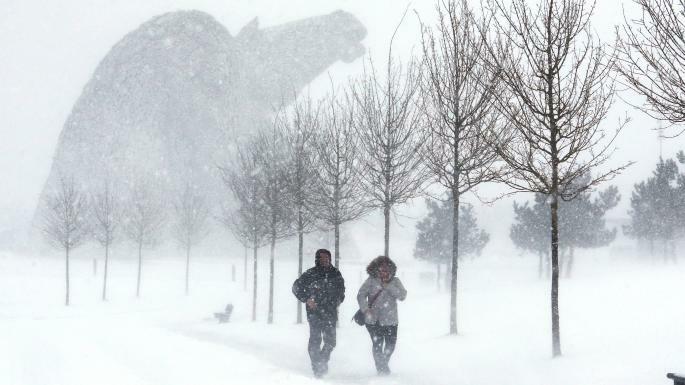 after a severe Arctic blast brought the country to a virtual standstill. Indeed, the British Army [has been] called in to rescue drivers trapped in cars as forecasters warn of more snow and howling winds. Or, as Instapundit likes to quote, tongue-in-cheek, an immortal eight-year-old MSM headline warning of global warming of climate change, Snowfalls Are Now Just A Thing Of The Past. writes Deborah Haynes as The Times features a rare intervention by a serving military chief. Indeed, as The Times reported a month and a half ago, The UK's Troop Cut Proposals Would Leave the Smallest British Army Since Before the Napoleonic Wars. … The shortfall in the armed forces budget is thought to be £20 billion to £30 billion over the next decade. Some of this gap must be filled by the MoD making more efficiency savings. 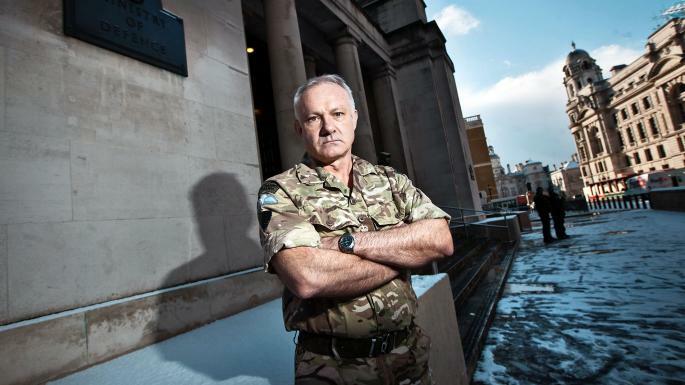 General Sir Nick Carter, the head of the army, has warned about Britain’s vulnerability to a Russian attack. Gavin Williamson, the defence secretary who is pushing for more funds from the Treasury, said last month that Moscow could cause “thousands and thousands and thousands” of deaths. Asked why the public should support new money for defence, General Messenger signalled that people needed to understand that their security was not guaranteed. “There are capabilities being produced by those states that don’t see the world in the way that we do, that could do us harm,” he said.